NOTE: Deployments will continue during August, 2016. 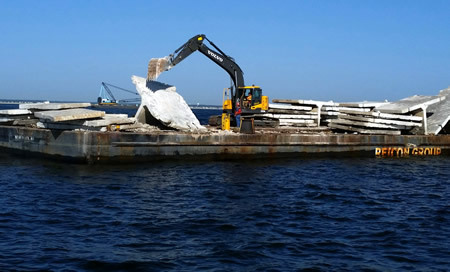 The Sea Girt and Axel Carlson Reefs, located offshore of Monmouth County and part of the NJDEP Division of Fish and Wildlife's Artificial Reef Program, will receive 1,853 yards of concrete rubble from a seawall. Each reef will receive one load of approximately 930 cubic yards. 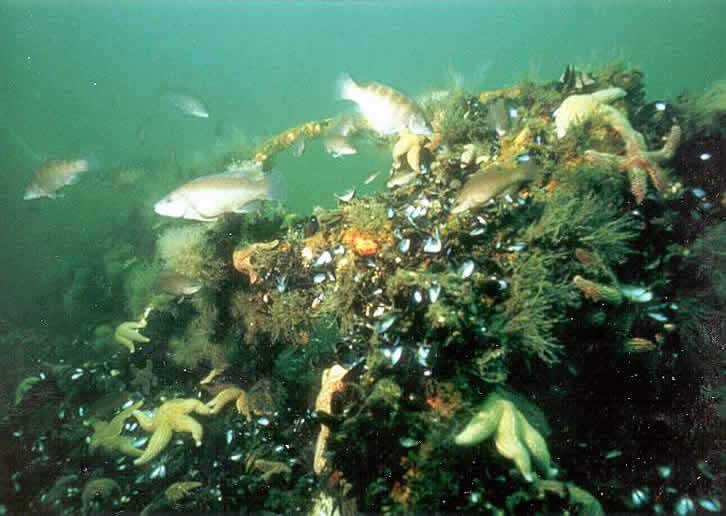 Once the concrete is deployed it will serve as an attachment surface for mussels, barnacles, hydroids, anemones, stony coral and other invertebrates, which will quickly cover the structures with a living carpet, providing the base of a productive marine food chain (picture below). 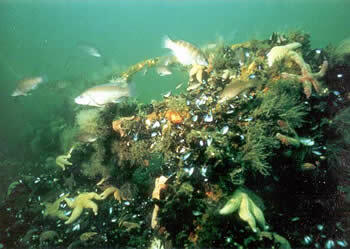 By summer, the new reef will be colonized by sea bass, tautog, scup, triggerfish and summer flounder. It will then become a favorite target of anglers coming out of Manasquan Inlet. Commercial fishers who have gear in this area during the time of deployment must move it or risk having it destroyed. The deployments are subject to weather and sea conditions. For further information contact Hugh Carberry at 609-748-2022.